More than 5,000 Burmese people turned up at the Myanmar Convention Centre to show their support for the 1988 democracy protest anniversary. The silver jubilee anniversary commemorating the 8.8.88 uprising that swept through Burma 25 years ago finished today with democracy leaders calling for the struggle for political freedom to continue. Keynote speakers, including Daw Aung San Suu Kyi and Min Ko Naing, paid tribute to the estimated 3,000 people killed in the 1988 protests and to those activists who continued to struggle for democracy during the last 25 years. 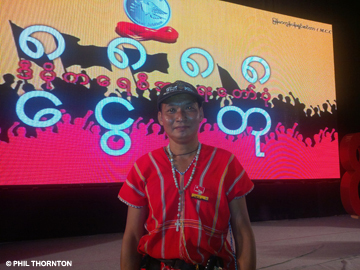 Thousands of people – monks, activists, ethnic leaders, journalists, labor activists, members of the National League for Democracy and members of the public packed Rangoon’s Myanmar Convention Centre. Those people unable to fit inside the large auditorium to hear the NLD leader, Daw Aung San Suu Kyi speak, watched a large outdoor video screen. Suu Kyi did not disappoint her audience – they laughed at her witty asides, applauded her political comments and drew silent as she explained what she saw as the three main platforms essential for the country’s future political development. Suu Kyi paid thanks to the 88 generation and democracy activists who had made great sacrifices. Suu Kyi called for a genuine rule of law to be put in place, stressed that national reconciliation had not happen and drew laughs from the crowd when talking about the constitution. Former army general and NLD elder statesman, U Tin Oo, spoke to Karen News about the 2008 Constitution. Outside the main auditorium, Kyaw Kyaw has taken three days of work to attend the 88 Anniversary. He explains to Karen News how the events of 1988 affected his life. Kyaw Kyaw said the country has to pull together and to work harder for political reforms. Kyaw Kyaw said now that his generation has had a taste of freedom they want more. Kyaw Kyaw explains that he took time off work to attend the three-day 88 Anniversary. Saw Kyaw Win traveled up from Letpadan Town to take part in the 88 Anniversary. The three days event included art and photo exhibitions and music. On August 7, Brad Adams, the Asian Director at Human Rights Watch, called for an inquiry into the 1988 killings. In a statement released yesterday to the media Mr Adams said. On August 8, 1988, thousands of students, Buddhist monks, civil servants, and ordinary citizens took part in national protests calling for democracy and an end to military rule. The military regime ordered soldiers to fire on protesters, killing an estimated 3,000 and wounding hundreds more.